This weekend to my great surprise I won a fancy dress competition. 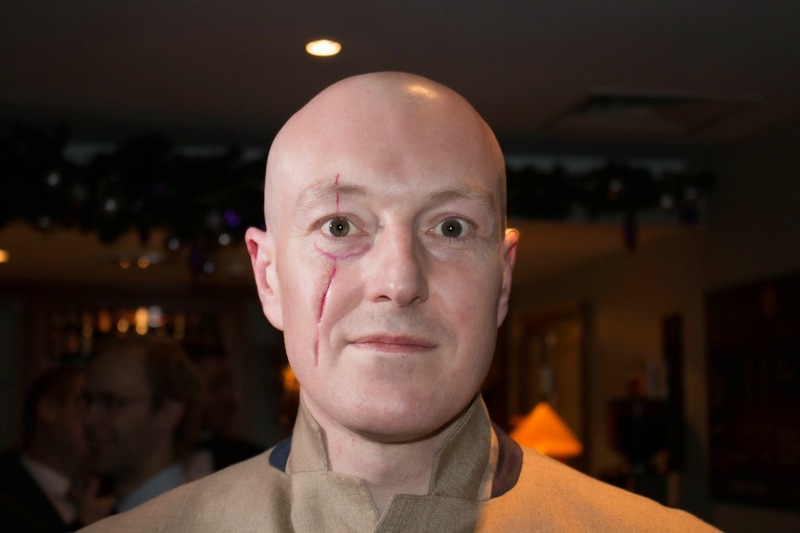 I wasn't taking it particularly seriously, but with a little effort and preparation I made a perfectly good Blofeld costume (the party had a James Bond theme). Blofeld is the villain with a fluffy white cat, a bald head, and the nasty scar. He's got a suit with a mandarin collar, a black and silver sovereign ring, and black shoes (a sure sign of evil!). I've got little enough hair, so it was no problem to shave it off. For the suit I repurposed my normal "Man from Delmonte" summer suit. I turned the collar and lapels up and held it closed at the throat with a shirt stud and a safety pin. The ring was made from a 10p piece bonded to a strip of tinplate cut from an old mustard tin. The 10p was "enamelled" with a black scrapyard marker. The scar was coloured with a dark pink lip-liner pencil and produced with theatrical makeup called Rigid Collodion. The most challenging part of the costume, other than being a boy and buying a lip-liner, was the fluffy white cat. I compromised and took a polar bear that I won in a raffle.